You know those blueberry bars from Starbucks? Yeah, well you can forget about those because these are at least one million times better. (Totally accurate and scientific measuring performed by my family's tastebuds). I used to work at Starbucks (and Blenz -- still one of my fondest job experiences) and would occasionally totally genuinely *ahem* accidentally drop a bar or two on the counter. Because their quality was compromised by the potential counter germs we had to throw them out... into my mouth. It was always such a shame. While my morality in the workplace might be questionable, my dedication to eating is not. Through these accidental taste tests I discovered blueberry bars. My heart will always belong to oat fudge bars, but I found a little room to develop a full-on crush on this refreshing treat, too. And while my days as a barista are long over, the crush is certainly not. So what's a girl to do? Make them herself, of course. 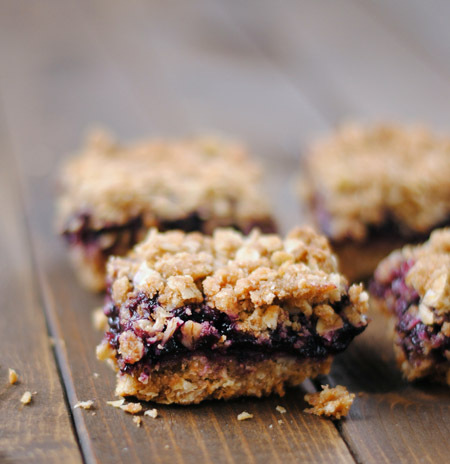 These blueberry bars use whole wheat, large rolled oats, and a hint of orange for a tart yet sweet summer treat. They're easy as pie to whip up, and are just the right amount of messy to be satisfying. And they're a lot easier to make than it is to get a job at Starbucks to compromise and consume their bar selections. Want to see more desserts as they come fresh out of the oven? Join me on Instagram! Want more tales of how I'm the worst employee ever, and other kitchen musings? Twitter and Facebook are where you need to be. Start by making the filling. In a medium pot, bring the berries, sugar, and juice to a boil, then simmer until the berries become tender. Whisk the cornstarch with a few tablespoons of water, until the lumps are gone, then whisk it into the berry mixture. (Don't just add the cornstarch directly to the mixture -- it will clump and be the opposite of awesome). Stir frequently until the mixture thickens, then set aside in the fridge until cool. Now you can make the crust and topping. In a large bowl, combine the oats, flour, sugar, zest, and salt. Give it a good blend. Cut in the butter, using a pastry blender or two knives (or your fingers -- shh), until it resembles small pebbly crumbs. Press half of the oat mixture into an 8x8 pan. Pour the now-cool berry mixture on top, then sprinkle the rest of the oat mixture over everything. Bake for 45 minutes at 350F, until everything is bubbly and golden brown. Let cool before cutting. I prefer to store these in the fridge so they keep their shape… if they last that long.